After taking 10 for 33 over the weekend, Shane Mitchell now has the best figures ever taken by a viking. Won the toss and batting. Great result. Slow going but we kept wickets in hand for the second 36 overs, which is the team plan. Flynn, MJ and Kelland all contributed nicely, without kicking on to a 50+ score. Bowled out in the last over of the innings for 177. The right plan but perhaps not executed perfectly. Bowlers did a good job. Tidy lines and lengths. At 3-60, we were right in it. Unfortunately, two blokes scored 50+ and were the difference. Pick of the bowlers was Cat. Great to have him back. Lost the toss and went into the field (good toss to lose considering how hot it was this 2nd week). Conor and Goss opened up and although bowling the tight lines like normal couldn’t get that early break through. First change bowlers Loch G and Kahlil, pretty much carried on doing the same and the score was marching on without really creating that initial first wicket. Eventually it took a great diving catch from Dizzy off Kahlil to dismiss their skipper and we were on our way, or what we thought. Tea came and they were still only one down for 99, and we were possibly staring down a big total to chase. Very soon after the break we got the other opener with a neat bit of fielding from Cam Emery that caused the run out. (he needed to as he dropped a pud off him earlier!!) From there the runs dried up (especially one batter taking nearly 8 overs to get off the mark and when he tried to open up he hit a catch to 1st slip!!) and with a splattering of wickets in between, as well as a few more dropped chances, we restricted the final score to 7/166, with that 7th wkt taken on the last ball of the 72nd over. Had we caught better, the total may have been lower. I ended up with 4 wkts with Conor and Kahlil a wkt a piece. Week 2, like all teams was a stinker and being one of two teams chasing runs rather than in the field defending, I thought if we bat out the overs a win would ensue. Well again, as in previous games, the top order didn’t really fire as needed, with most getting a start without building an innings of note. 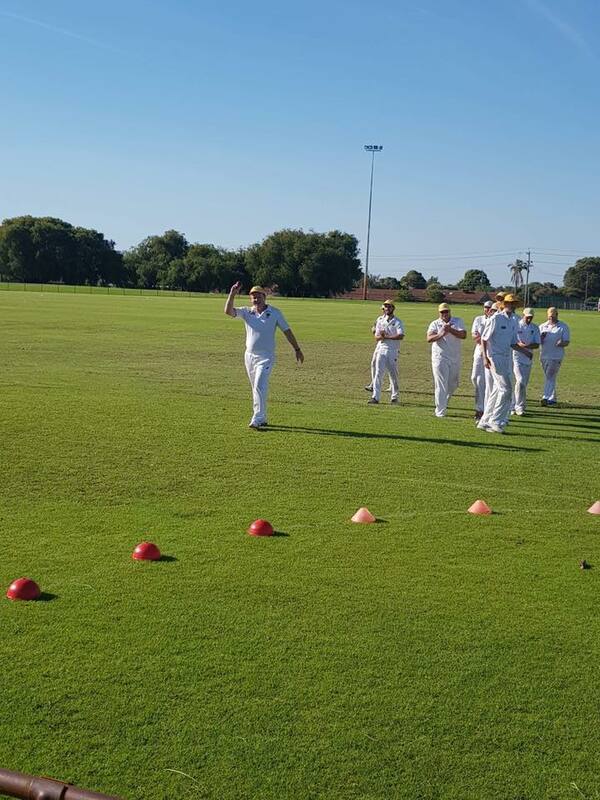 After a cautious start from Kulevski (11) and Willsy (21), wickets fell at regular intervals and at tea we were on par runs wise with them but had lost 4 additional wickets incl Cam Emery (21), Linc (15) and Cam (0) and claim his 2nd ‘kuiper’ in 3 games. It was going to be up to the lower order to get us home. Dave Sharpe had come in earlier than expected and batted really well and did the bulk of the scoring in a 40 run stand with Dizzy (12) and 21 with Goss (7) and was nearing the winning total when he too lost his wicket with only 7 runs to get. From there it was agonising watching from square leg, with heaps of overs left, as Conor (2) and I Wells (8) protecting that last wicket as they negotiated the last several overs of maidens, the odd sundry and the odd run off the bat to secure the win in the 64th over. Conor holing out to a good one-handed catch at mid-on as the clock ticked towards 6pm. Two close wins against the same opposition (one defending and one chasing) will put us in good stead for future games. Sharpey deserved the BOG gong as he played a major in the scrappy win with a well compiled 5 and although was bitterly disappointed not to be there at the end, without those valuable runs we would have been well short. Hopefully the top order can gel at some point running into the business end of the season. The two day game in round ten, h grade headed down the road to take on the rivals Warwick greenwood. After playing Warwick the game before and getting the win, we were hoping to keep that winning momentum going and grab another win. If we were able to come out with a win it would put us back on top of the ladder. Selection for any 2 day game was hard with a lot of 1 and 2 week player but this game was a bit different for us. Out of the list of player I had, seventeen were unavailable to play so I decided to try a get some former players. After a bit of negotiation Paul Sampson and Jeremy Thompson both agreed to play which were both handy inclusions. We ended up losing the toss but they decided to put us in on a 36 degree day, a decision that turns out to be a cooler option. I decided to change things up with the batting line up and put myself in to open. After a steady start we found our self 2 for 40 after 10 over. After a long think about the bating line up I came up with another idea to promote Michael Di Marco and Brad Weir up the order to try protect the middle order a bit and hope for some quick runs. The decision paid off with Michael making 49 runs and Brad making 35. Tommy Marcic got back in the runs with a handy 53. At tea we were 5 for 160 looking like we were going to post a nice total but unfortunately we fell apart quickly and were bowled out for 200 with an hour and a half left of place. We needed quick wicket so we opened the bowling with duffman and di Marco. The restricted the score and made it an uncomfortable last hour. Duff got the first wicket and the second, the second been better than the first. When duff found the edge and it flew to matt paddock waiting at 3rd slip. Matt couldn’t believe he had held onto a ripper of a catch. We closed out the day having them 4 for 30 with both duff and jez Thompson picking up 2 wickets each. We started the second week with a positive attitude and it paid off early with duff taking a wicket in the first over. As the day went on it became more and more obvious that at the end of the first week they had not sent in their best batsmen. Warwick’s skipper came out next and started swinging from ball one. He made a quick 30 and we got the next batsman cheaply. Having Warwick 7 for 79 at the drinks break we thought we were on the edge of victory. After the break Di Marco, Duffield, Sampson and Thompson bowled extremely well considering the high temperature that we were facing. Unfortunately we just had no luck the partnership put on a 100 run stand before we finally got a wicket. The last 2 wickets fell quickly after that and we bowled them out for 184 giving us a 16 run win. There was an hours left of play for some batting practice where we ended up on 5 for 105 with brad making 42 of those with 4 big 6s. Great win everyone contributed and survived the extreme conditions. Vikings Season Wind-Up - Tickets on sale NOW!